At BioMan Biology users will find free learning games, review games, virtual labs and quizzes that will help them learn about cells, ecology, genetics, physiology, and more! Interactive Biology is a website offering a series of videos, quizzes, and study guides for biology students. The site offers study guides for sale, but there some good free resources available too. The best free resource found on Interactive Biology is the Interactive Biology YouTube channel. There are ten multiple choice quizzes based on information in the videos and study guides. Each quiz offers immediate feedback and provides a hint if you get a question wrong and want to try it again. The Crash Course Youtube channel has animated videos covering various topics in science and other areas. SciShow is a Youtube channel with videos on multiple topics. Every Day Chemistry's Youtube channel has a number of inquiry-based videos. Science Fix's Youtube channel has a number of videos to help students understand science through demonstrations. Steve Spangler has a few Youtube channels full of demonstrations, experiments and explanations. The Biology Department at Davidson College has put together a large collection of videos and animations of cell biology processes. produced by The University of Nottingham. The playlist on the elements has been found to be very useful. Dr. Saul's Biology in Motion features interactive activities and animations for students to use to learn human biology concepts. Learn Chemistry is a production of the Royal Society of Chemistry. It provides educators with resources for teaching chemistry lessons to students of all ages. MIT Tech TV is a collection of thousands videos produced by students and faculty at MIT. provides short physics lessons (most of them are actually longer than a minute). students learn about the basic physics principles involved in the use of levels, pulleys, planes, axles, and wheels. Circus Physics is a series of eight short videos. Each of the videos features a circus act that demonstrates a basic principle of physics. Each video clip is accompanied by text and image explanations. Forces of Nature is a film produced by National Geographic designed to educate students about volcanoes, earthquakes, hurricanes, and tornadoes. 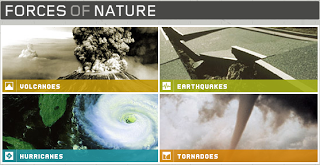 The Forces of Nature website provides a list of complete lesson plans. alphabetically around the sequence of topics typically taught in an introductory earth science or physical geography class. Geology.com has a teacher section with links to many useful resources for geology instruction. This link will bring you directly there. TryEngineering offers a lot of information about engineering careers, skills, and concepts. There are downloadable lessons and engineering games to play. NASA has a number of resources as well as projects classes can partake in. Most resources emphasize STEM skills and concepts.